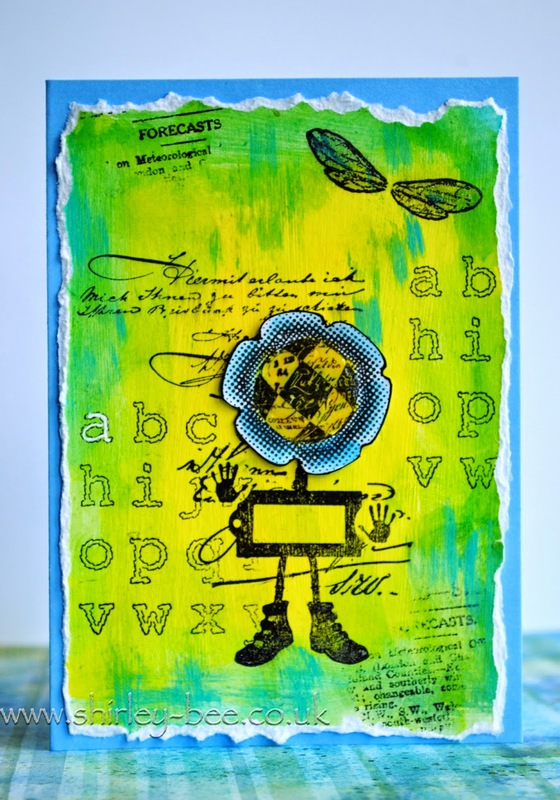 I'm playing along at Paper Artsy, with a card inspired by this canvas by Liesbeth Fiddler. Mine's nowhere near as detailed as Liesbeth's, but there's still plenty going on. I primed a piece of card with gesso before colouring with yellow and green gelatos (thanks for the tip, Jenny - it worked a treat!). Stamped several Paper Artsy images, and stamped the flower on separate card, coloured, cut out and added Glossy Accents to the centre, then mounted it with foam dots. I used a white gel pen to highlight one of the letters and wink of stella on the wings and his boots, and scribbled some blue paint in places. Don't forget about the new Mixed Media Card Challenge - a touch of nature. What a stunning card Shirley,the colours are really zingy. Oh nice! I like that you did a man instead of a lady. This is one COOL card, Shirley! I love it!! I really love the brushstroke edge! It set my eyes up to look for more details and there are plenty! Thanks for sharing today!! What a FUN image Shirley! love the bright colors and the spots of gloss!